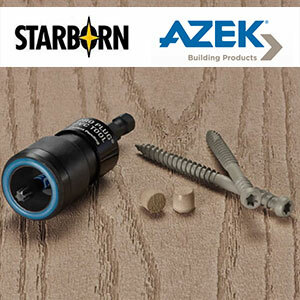 Get a seamless and secure installation for your AZEK deck with the new Pro Plug System for PVC. The System consists of two components, which are sold separately; The Pro Plugs and the Pro Plug Tool. Fasteners come in your choice of epoxy-coated steel or 305 stainless steel, and plugs are made of actual AZEK decking for a perfect match. The specially designed tool drives your screw to the perfect depth while it creates a precise hole for the PVC plug. Why We Love It: This system creates a fastener free surface with a traditional method and modern materials. Why It's Unique: These plugs made from actual AZEK PVC deck and trim material so the finishes will match perfectly. Why You'll Love it: These pro plugs are great for stairs or end boards where hidden fasteners are not an option.